We are all involved in the same great sport. Whether you are a recently qualified open water diver or an experienced diver who has travelled to the farthest oceans of the world, there is a bond that connects us. We are all divers. One notable feature of this bond, one that connects even the most occasional diver with the pioneers who push the frontiers of underwater exploration, is the way in which those at the cutting edge of the sport influence how the rest of the world dives. 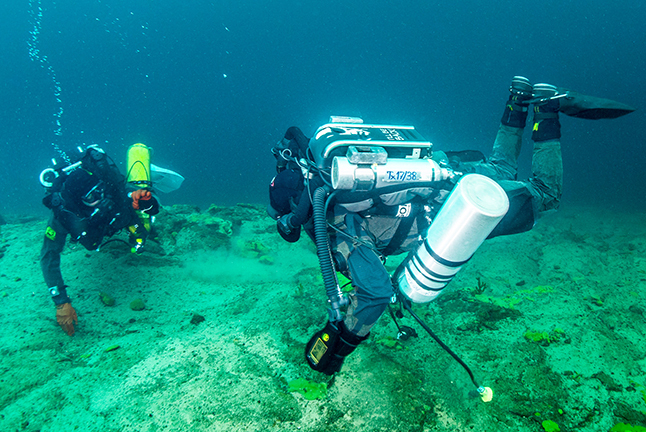 Technical divers with rebreathers in Lake Baikal, Russia. Photo by Andrey Bizyukin. In the automobile industry, technologies such as ABS braking, air bags and push-button ignition were originally developed for racing cars but have now found their way into family saloons. Similarly, significant developments in scuba equipment and diving practice that were initially devised by the technical diving community have been passed on to the sport diving community at large and are now universally accepted and adopted. It may be hard to believe now but there was a time, not so long ago, when many of scuba’s most influential organisations and periodicals forecast that to introduce nitrox to the recreational diving community would lead to disaster. They dubbed it the “Devil Gas” and forbade all exhibitors at dive shows from advertising anything to do with nitrox. One major tourist destination, the Cayman Islands, initially issued an edict banning nitrox diving from its waters completely. However, technical divers had been using higher oxygen mixes safely to extend bottom time and conduct safer decompressions for years. In a demonstration of people power, divers all over the world decided that they would ignore the warnings of the entrenched conservative scuba establishment and flocked in their thousands to the technical training agencies to see for themselves what nitrox was all about. This forced a dramatic about-turn from the mainstream organisations, which all now espouse nitrox wholeheartedly and even offer it as an option on beginner diver courses. Today, nitrox is everywhere and, whereas, in the early 1990s, divers with nitrox tanks on their backs raised heckles, in 2018, the sight of the green and yellow bands does not even raise an eyebrow. For a long time, divers carried only one second stage regulator and learnt to “buddy breathe” in an out-of-air emergency, with two people sharing a single second stage. However, cave divers trying to exit together following an air-supply crisis found it very difficult to buddy breathe through narrow sections of a cave and solved this problem by adding another second stage to their regulator set-up. This was attached to a hose long enough to permit two divers following each other to breathe from the same cylinder. Eventually, this practice found its way out of the caves into mainstream diving, via the wreck diving community. Sport divers immediately saw the advantages of each air-sharing diver having his or her own second stage and being able to move relatively freely while breathing from the same cylinder, thereby reducing stress. Divers used to just allow their hoses and accessories to hang down freely. That was in the days before configuration, a concept developed out of necessity by divers operating in confined spaces and at extreme depth. They had to work out ways of stowing equipment so that it would not get caught up and damaged, and yet still be easily accessible in an emergency. Using stainless steel and brass snaps and D-rings allowed accessories and hoses to be attached closely and securely. It also made the divers more streamlined and allowed them to move more easily through the water, particularly against a contraflow. Recreational divers noticed what the technical divers were doing and saw the practical value. Manufacturers took note of diver demand, and D-rings and snaps started appearing everywhere. Not all the products that appeared were an unqualified success, however. Some manufacturers just did not understand the concept. They added D-rings to loose chest straps that looked deceptively functional when a diver was vertical and standing, but just allowed any objects attached to swing back and forth like miniature wrecking balls when the diver was horizontal and swimming. At the lower-budget end of the market, manufacturers economised by painting plastic D-rings silver instead of using metal. These, of course, just snapped and were rendered useless as soon as any pressure was applied to them. Nevertheless, the overall trend has been positive, and divers at all levels are now able to set their equipment up much more efficiently and effectively than before. But the configuration revolution is still a work in progress. You still see many divers with hoses dangling free and with accessories hanging pendulously from lanyards. It would be good to see more emphasis on configuration in beginners’ courses. Delayed surface markers buoys (DSMBs) were initially popularised by technical divers, who used them as an aid to maintaining control of their depth during long decompressions and to enable the dive boat to follow the dive team as they drifted. Divemasters all over the world, particularly those operating in areas with lots of boat traffic, saw the safety advantages of inflating and sending a DSMB up from depth to identify the location of divers who were about to ascend. Now, even new divers are being taught how to raise an inflatable buoy from their safety stop. This is another trend, however, that has yet to be universally adopted. But it is a vital skill for a diver to have and deploy. It not only tells the pick-up boat where the divers are, but it helps ensure that other boats keep clear too. If every diver on every dive ending in the open sea always came up under either their own marker buoy or someone else’s, scuba diving’s safety record would improve enormously. Of course, all that was required was that divers adapt their technique slightly. Then they could benefit from a design that held a diver’s head higher above the water on the surface, was easier to control than a wraparound BCD and did not squeeze the diver’s rib cage and inhibit breathing when the air cell was inflated. Divers loved the lack of encumbrance and freedom of movement permitted by having just a harness instead of an inflatable jacket around their torso. They also liked how much easier it was to swim horizontally when your air cell was all behind you. As with nitrox, divers voted with their wallets and drove the change in the industry. Now, with most BCD manufacturers offering harness and wing options, ever more divers are gravitating towards them and people are even being taught to use this style of BCD right from the start. Simon Pridmore is the author of the international bestsellers, Scuba Confidential: An Insider's Guide to Becoming a Better Diver, Scuba Professional: Insights into Sport Diver Training & Operations and Scuba Fundamental: Start Diving the Right Way. He is also the co-author of Diving & Snorkeling guides to Bali and Raja Ampat & Northeast Indonesia and a new adventure travelogue called Under the Flight Path. His recently published books include Scuba Exceptional: Become the Best Diver You Can Be, Scuba Physiological: Think you Know All About Scuba Medicine? Think Again! and Dining with Divers: Tales from the Kitchen Table. For more information, see his website at: SimonPridmore.com.